This ham and bean soup recipe originated in New Orleans. The history as I understand it is that some version of this recipe was a favorite of African-American cooks from the last century. It’s an easy one pot meal that can be seasoned with a nice ham bone left over from another meal. The beauty of it, besides tasting great is that it's the perfect recipe for a ham bone and it tastes even better reheated. This dish is still served in some form or another in upscale restaurants in New Orleans. If you own a pressure cooker you can start with dried beans, put the ham and bean soup recipe together as directed below and then pressure cook for about 30 minutes. Some people swear that using a pressure cooker also reduces the gaseous affect of the beans. Read below for more ideas on how to minimize this slight unpleasantness. You can also just soak your beans over night and start them simmering about an hour or so before you plan to eat. If you’re planning a ham dinner this is the perfect recipe for leftovers. Start the beans 1 1/2 hours before you want to eat. Rinse the beans thoroughly and place in a large 3 - 4 quart quart pot and cover with 2 inches of water. Simmer for 1/2 hour (or half the time the package says.) While the beans are cooking heat the oil in another 5 quart soup pot over medium high heat. Add ham and brown for 5 – 10 minutes. Transfer to a plate. Add the onions to this pan and stir until soft about 5 – 8 minutes. Add the garlic and cook for 30 seconds. Drain the beans and add them to your soup pot with 2 quarts of fresh water. Add the bay leaf, parsley, thyme, salt, ham bone, pepper, ham and stir to combine. Add the celery and carrots after it’s simmered for about 20 minutes. Cover and cook another 30 minutes until the beans are done. Discard the bay leaf. If you would like a heartier ham and bean soup recipe, cook 1 cup of barley to 2 cups of water, bringing to a boil and then simmering for 1/2 hour. You can serve the soup over the barley in soup bowls. Garnish with sprigs of parsley. Add a little hot sauce if you would like more spice. Serves 8 – 10 and makes great leftovers. If you have a pressure cooker then you just cook everything together for 1/2 hour. There are so many recipes for bean soup but this classic stands alone. Ham and bean soup is truly American cuisine – a one pot meal that you can serve with a green salad with tangerine quarters. The citrus goes well with the soup. AVOID GAS: Some suggestions for this problem are to go slowly. Eat small portions often until your body is used to them. Eating them early in the day before you’ve walked or gone to the gym helps. Adding garlic, cumin, ginger or a little vinegar at the end of cooking helps. How to cook beans includes soaking most varieties which will make them more digestible. Soak them over night the night before you plan to cook them. Sometimes this is all it takes! Return from Ham and Bean Soup to Low Glycemic Recipes. 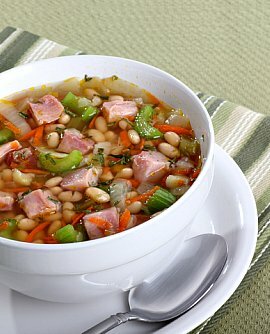 Return from Ham and Bean Soup Recipe to Lifetime Fat Loss home page.